It has come to PAWS' attention that there are people out there who are out to put down and ruin PAWS' reputation, claiming PAWS did not help when they reported to PAWS. We usually take the time to explain how PAWS can help and how the concerned citizen can help - but if the reporter demands for rescue or cuts off the explanation without willing to understand or is close-minded about what PAWS is able to do, there is not much we can do. PAWS is an undermanned animal welfare NGO (with no support or funding from the govt) with limited resources. We are able to help the animals WITH the help of concerned citizens. Our FAQS mention how concerned citizens can help in their own way without waiting for a response from PAWS or an animal welfare group, especially if they are in the area where the animal is located since they are the first line of assistance for the animal. PAWS is primarily not a rescue group that picks up strays and abandoned animals. Our primary mission is to educate and promote responsible pet ownership so that there will be no strays or neglected animals to be rescued. Though we do have 200+ dogs and cats in our shelter (with only 2 caretakers, only 1 shelter vet), our shelter is primarily for dogs and cats who are victims rescued from neglect or cruelty cases where criminal charges have been filed against animal offenders or irresponsible owners (with the help of an informant or witness who came forward with witness affidavit). There are instances where we are able to admit strays or abandoned animals in distress (those who face imminent danger of losing life or limb) when there is a vacancy in quarantine area which is rare as we are constantly full -- so we need a foster person who can temporarily care for the animal in need until we are able to admit the animal. While the animal is in the foster person's care, we will take care of the medical needs at our clinic. If we cannot admit the animal being reported to us, we always advise how PAWS can help (medical treatment at PAWS Clinic for as long as there is someone can foster) and what the concerned citizen can do. YES, we encourage people who witness abused and neglected animals to help us file charges against the animal offender or irresponsible owner to prevent this same situation from happening again. 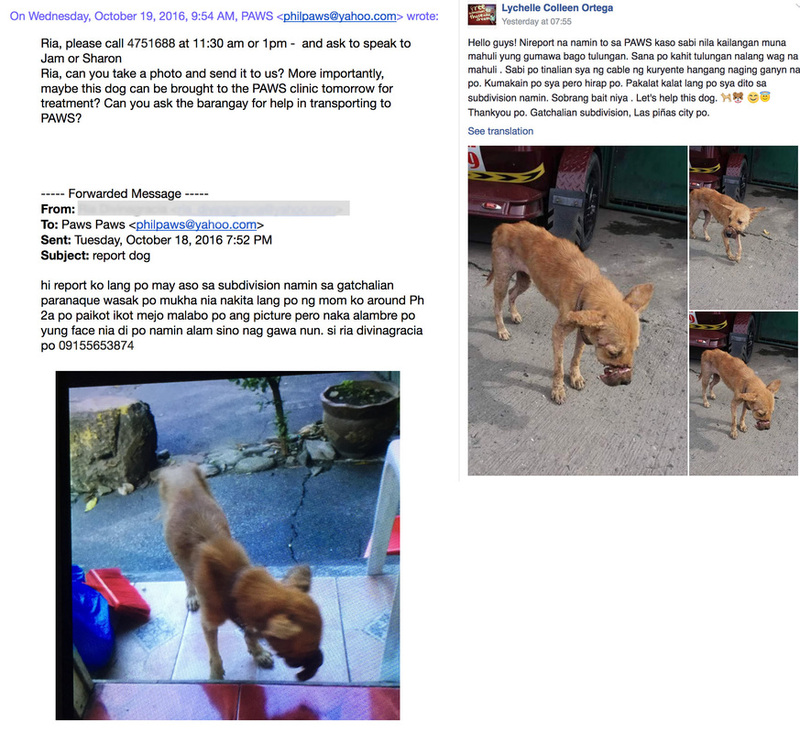 While waiting for charges to be filed, we are very much willing to treat the animal at our clinic in QC. If we do not try to educate errant pet owners (in a friendly manner, not by threatening a lawsuit) on how to improve their pets' living conditions AND/OR file charges (if the owner is uncooperative and not open to friendly advice on proper care), these pet owners will never learn and continue to treat their animals in pitiful living conditions nor will they be held accountable for their actions if concerned citizens keep quiet or just take over the responsibility of caring of the poor animals. These irresponsible owners will keep getting a pet in exchange of the one that was rescued and end up neglecting them once again. The barangay can be tapped for assistance since they are in the position to counsel neglectful pet owners - let's make our taxes work for us. If one wishes for an NGO like PAWS to intervene, we hope they are willing to send an affidavit.